There will be spoilers. Deathly spoilers. Expect them. 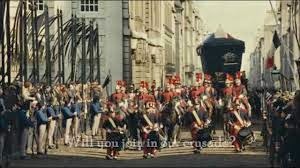 Though I’m not sure why I should be warning you, because Les Miserables has been out for 150 years. Oh, well. I’m warning you anyways. 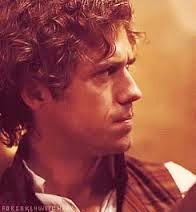 Adjectives that describe our dearest Enjolras: bold, brave, courageous, fierce, harsh, icy, passionate, red, and just. If any of you are familiar with the MBTI personality typing system, I’d say ENTJ or INTJ. Whether he’s an introvert or an extrovert can depend on who’s playing him and how he is portrayed. I think Aaron plays him as more of an INTJ, because he seems more reserved and self-contained than the stage version of Enjolras often is. Now I don’t mean terrible in a “I’m a super-villain” way. I’m saying it in a “I have such inner strength and resolve that it would be terrible to see it all.” He is not a soft man in any way, and in some ways, he is even harsh and hard. But despite this, he has such a love for justice and the people. One of his most beautiful lines in the musical is, “Let others rise to take our place until the earth is free!” And when he says that, he MEANS it. I don’t think Enjolras would ever say something flippantly and especially not something of that gravity. He truly is prepared to fight and even die for what he believes in. And he does. He makes a huge sacrifice and is brutally slaughtered by the French army in an attempt to bring about change. He dies with dignity, holding his head and a flag up high. He dies with wisdom beyond his twenty-odd years; he dies with an old soul, saturated in his red passion for the freedom of men. He doesn’t really take nonsense from people. He basically tells Marius that love is ridiculous when they’re planning a rebellion. “Who cares about your lonely soul? We strive towards a larger goal. Our little lives don’t count at all!” This is something that Enjolras truly believes and while I don’t entirely agree with him, I admire him for being able to focus entirely on the rebellion. 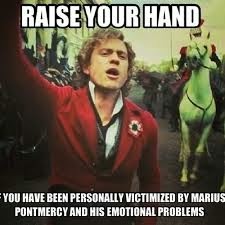 Enjolras is the leader of the revolution. He has such charisma that allows people from Grantaire, the drunk cynic who doesn’t really care about anything; Jehan Prouvaire, the hopeless romantic who writes poetry and loves flowers (swoon. Yeah, he’s one of my favorites too. ); and Combeferre, the bookworm who keeps Enjolras grounded; to follow him. People trust him so much that they would follow him into battle, even death! As a true leader, he doesn’t abandon his friends to die alone, he bravely dies with them. You know how people say, “I’m a lover, not a fighter, but I fight for what I love”? That’s not Enjolras. 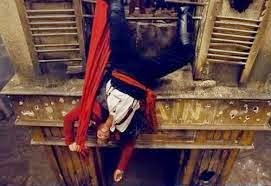 Enjolras is a fighter and he will only stop when he knows that he can; when all the injustice and pain is gone and freedom has risen. He is angry and he will fight until he’s dead, the other man’s dead, or he got what he wanted or knew was right and true. 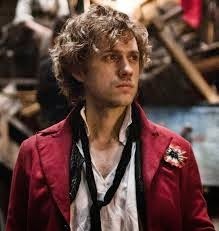 I think one of the most surprising things about Enjolras is that he has hope. I don't think people often see that in him, but it's incredibly true. If he didn't have hope, he wouldn't be fighting this crazy rebellion to free his homeland from oppression and injustice. Personality-wise, Enjolras and I are pretty different. I’m pretty soft-spoken, while Enjolras is marvelously outspoken and is blessed with laser-vision concentration. (Yeah, I call it laser vision. It rocks, I know.) He’s a character who I strive to be like; I want to do what I know is right, knowing the consequences and choosing to do it anyway. :D I have a fangirl crush on him as well, so don't feel bad about that! :) He's always been one of my favorites and I'm so glad that there are more fans of him out there! I am the female version of Enjolras.